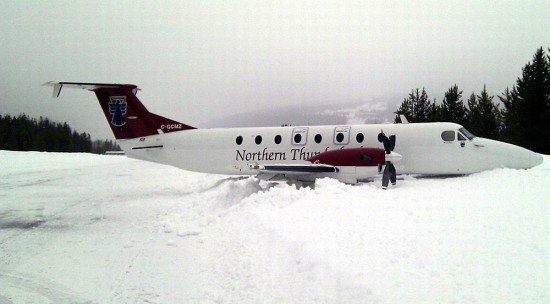 A Canadian Beechcraft 1900C suffered a runway excursion upon landing at Blue River, BC, Canada. The pilot flew an unstable approach to an unmarked runway in deteriorating weather. The occurrence flight was chartered by a travel agency on behalf of a wilderness adventure ski lodge. It was a regularly occurring charter flight between Vancouver and Blue River, BC, Canada. The travel agent verbally passed weather information to the flight crew. The captain understood that the runway had been plowed the previous day, and that the weather had been good that morning in Blue River. Before departing Vancouver, the flight crew had also obtained official weather data from regular flight planning sources. It was noted that although current conditions at Blue River were good, a weather system was moving northbound, and conditions in the area of Kelowna, Kamloops (CYKA) (the alternate), and Blue River would begin to deteriorate. As the flight progressed, the ski lodge radio room operator overheard the flight crew discussing weather conditions with a local helicopter pilot on the ATF as the flight overflew Blue River, but the operator did not have any direct contact with the flight. The crew was satisfied with the information received from the helicopter pilot regarding local weather. Because the Blue River aerodrome does not have a published instrument approach procedure, the intention was to fly over the aerodrome and proceed under visual flight rules (VFR) into the aerodrome. The flight progressed as planned until the aircraft passed overhead Blue River at the lowest useable IFR altitude, and the pilot was not able to descend under VFR into Blue River. The pilot then climbed back up to an enroute IFR altitude and continued to Valemount Airport under IFR. After conducting the IFR approach into Valemount and finding the weather suitable for flight under VFR, the aircraft completed the 60-nautical mile (nm) trip back to Blue River visually. The aircraft slowly descended in steps as it flew south towards Blue River at a reduced cruise speed of approximately 175 knots. As the aircraft neared the aerodrome, the pilots descended to altitudes as low as 1100 feet above ground level (agl) to maintain visual contact with the ground in deteriorating weather. Approximately 4 nm from the aerodrome, and 85 seconds before touchdown, control was transferred from the first officer (FO) to the captain, who became the pilot flying (PF). During the approach, the crew rushed to complete the pre-landing checks, visually acquire the runway, and manoeuvre the aircraft to land. The captain turned slightly to the left, away from the runway centreline. At this point, the FO called visual contact with the runway, and the captain turned right, back towards the runway centreline, and again passed through the runway centreline. The captain did not acknowledge that the runway was in sight. The aircraft was configured for landing 25 seconds prior to touchdown. As viewed from the pilot’s perspective, the aircraft was to the left of centreline. Several seconds later, the aircraft initiated a right turn to line up with the centreline of runway 19, but actually crossed to the right of the centreline. The aircraft then overflew several buildings on the right of the runway centreline, approximately 75 feet adjacent to the runway threshold. The aircraft then turned sharply to the left as it passed abeam the threshold, then sharply right to aquire the centreline before touching down approximately 2000 feet past the threshold. Immediately after touchdown, the aircraft veered left into the snow bank. During the last 23 seconds of the flight, the FO broadcast a traffic advisory to indicate that the aircraft was on final, made 3 speed calls, and advised the captain that the runway was to the left. There were no remarks made by the captain since the request for the landing checklist. The FO did not declare an unstable approach, or prompt the captain to execute a missed approach. Although the hazardous runway condition had been identified by the company’s safety management system, the delay in action to mark the runway allowed this condition to persist. Up-to-date weather and runway condition information was not provided to the crew, nor was it requested by the crew. The pilot continued the approach below the visibility limits specified in the company’s standard operating procedures. Deteriorating weather, as well as the lack of approach aids and runway markings, hampered the pilot’s ability to establish the aircraft onto a stable final approach prior to crossing the threshold. The company’s standard operating procedures for stabilized approaches were not followed, and an unstabilized approach was allowed to continue. The pilot was unable to position the aircraft over the centre of the runway as it settled to land, and the left main landing gear entered the deeper snow at the runway edge, causing the aircraft to veer into the snow bank. If a company’s risk mitigation strategy is not implemented in a timely manner, hazards are allowed to persist, increasing the risk of an accident. If company standard operating procedures do not include criteria and procedures for stabilized approaches, or they are not followed, there is an increased risk of landing accidents. Operating on a snow-covered runway that does not have markings or devices to allow a pilot to easily identify the runway surface increases the risk of runway excursions. If the identified risks and mitigation strategies are not communicated to the people exposed to the risks, it is possible they will deem the risk as acceptable to management and continue operations.